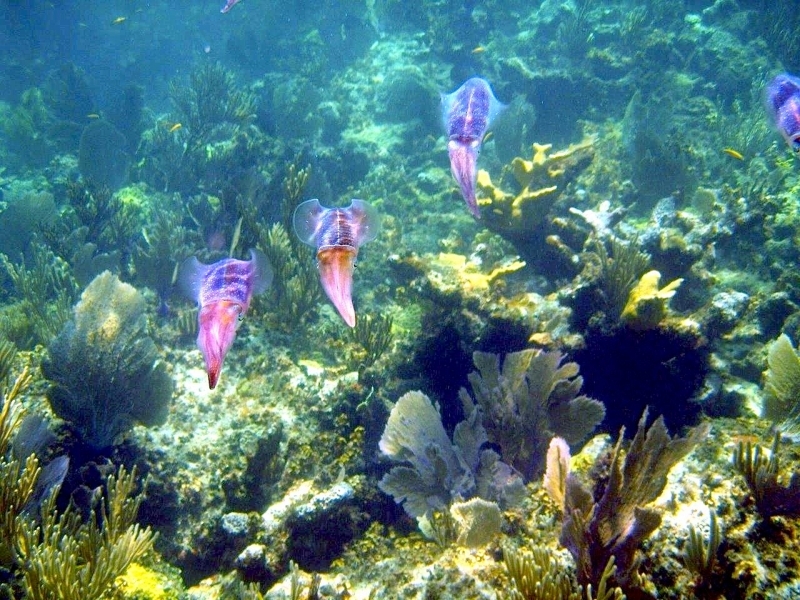 Caribbean Reef Squids are 10-arm cephalopods with torpedo-shaped bodies with the hood-like part above their heads called the mantle which contains their stomach, gills, ink sac, pen, reproductive organs and digestive organs, 2 large complex eyes, 8 short arms near their mouths and 2 longer tentacles, tucked inside, armed with suckers to capture prey. 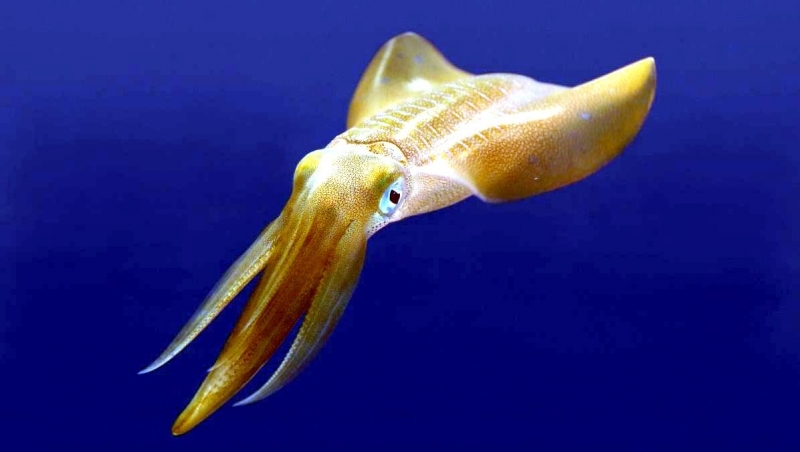 Their fins extend nearly the entire length of their body and undulate rapidly as they swim. 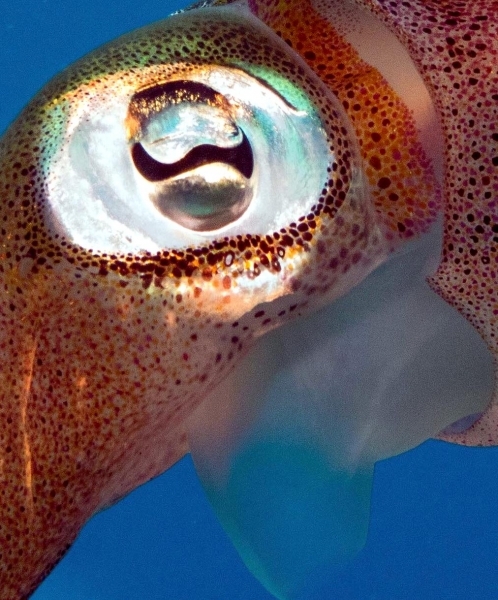 All 10 appendages of the squid are “fixed to its head” and are arranged in a circle around their mouths. 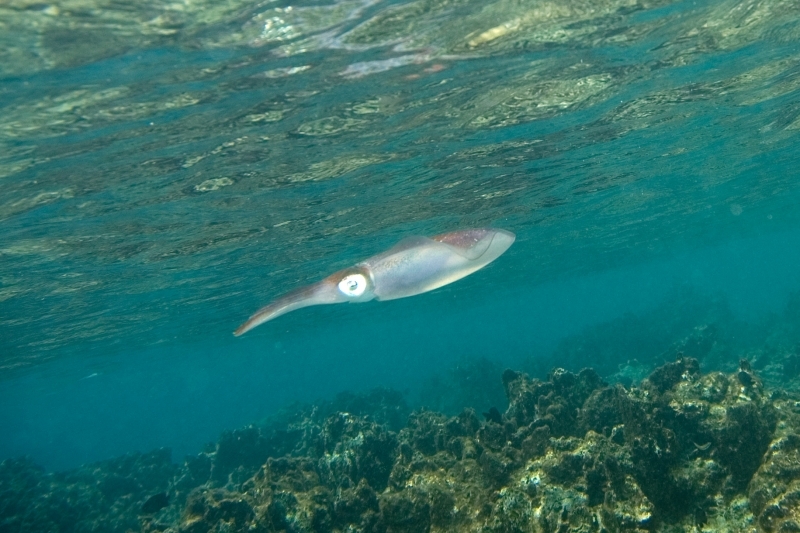 They are often encountered among shallow reefs and are usually unafraid of divers, if not curious about them. 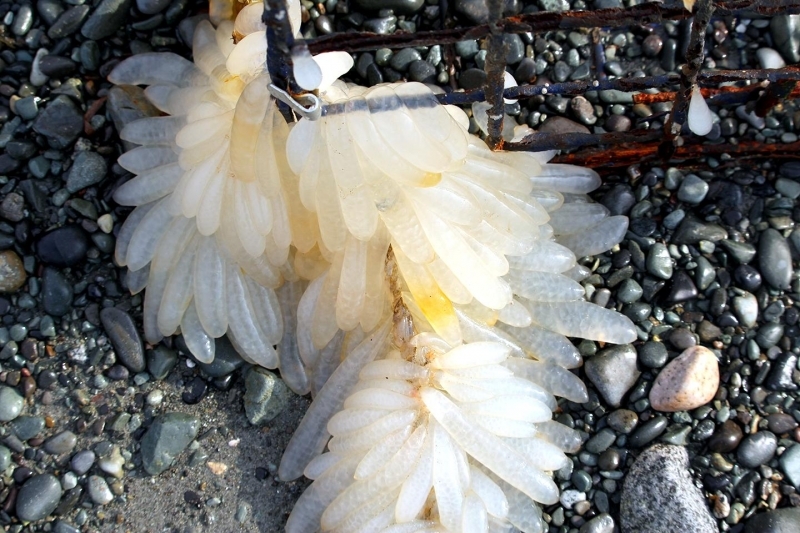 The mantles of newly hatched babies, are about 8-9 millimeters in length and the mantles in adult males and females reach 12-20 centimeters in length. 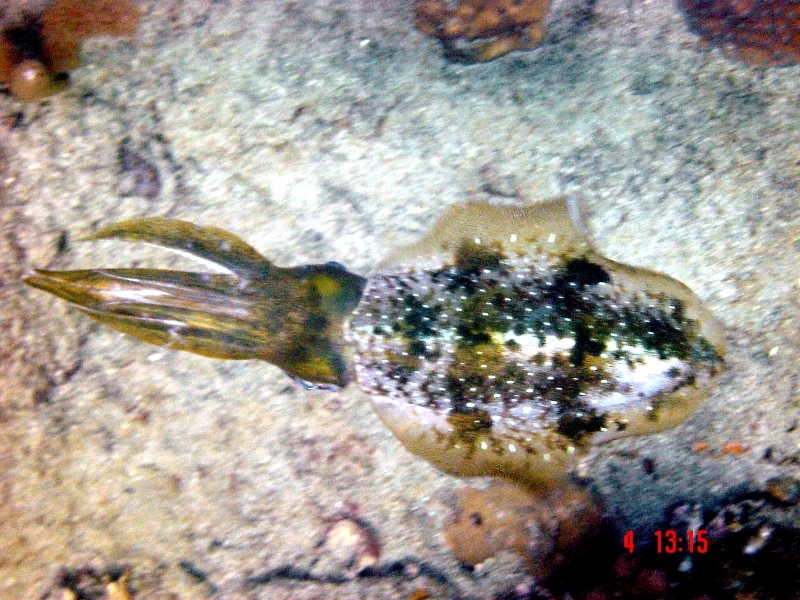 Adults closely resemble their cousins the Cuttlefish, in that their bodies are broad and less streamlined than many other squids. 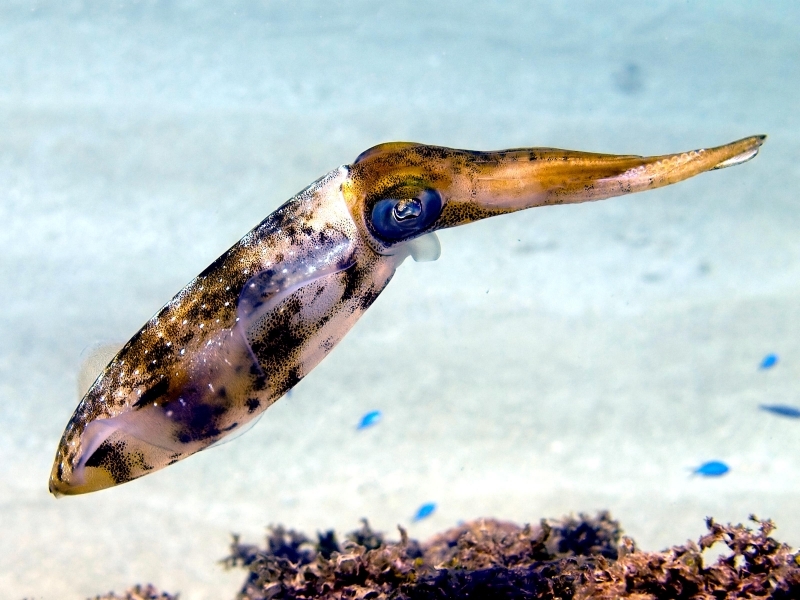 Caribbean Reef Squids can also move about using jet propulsion by shooting water from their pallial cavity (an area inside their mantle) through their funnel to move rapidly through the water. 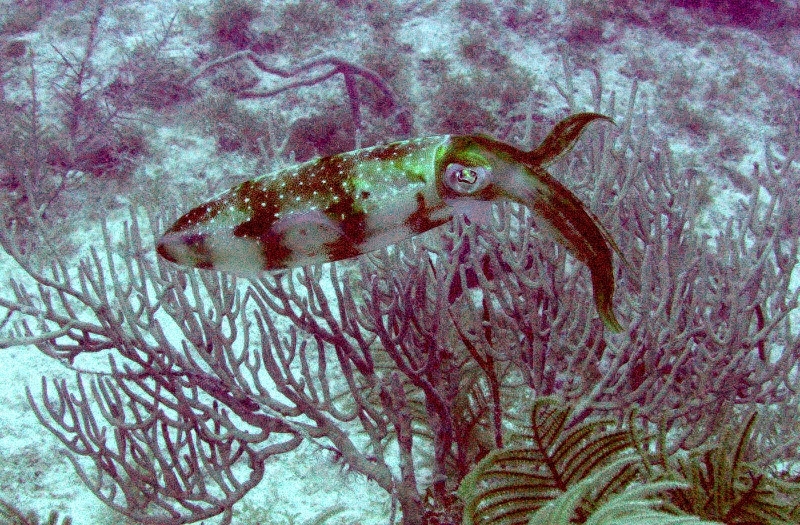 The basic coloring of a Caribbean Reef Squid is a mottled medium green to brown on their dorsal (upper) side with lighter coloring on their ventral (under) side for camouflage from predators swimming above or below them. 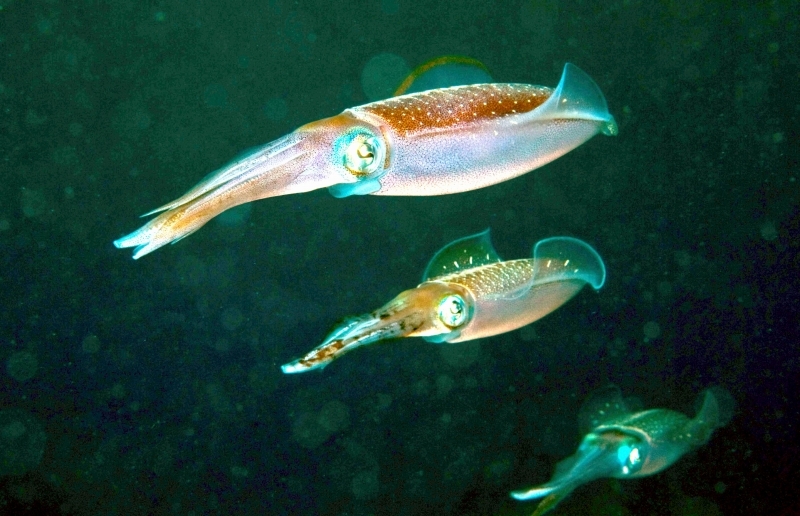 These animals are social creatures often found in small groups that communicate through a variety of complex signals. 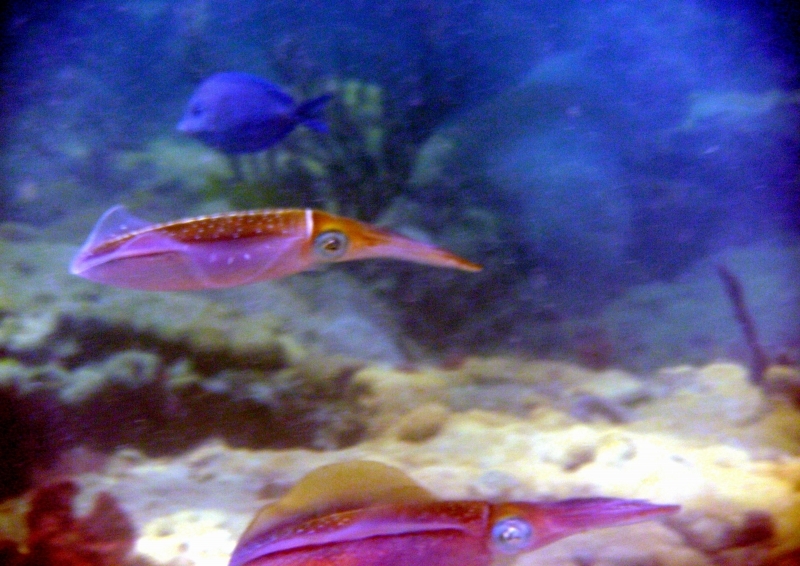 Caribbean Reef Squid communicate by controlling the pigment in their skin. 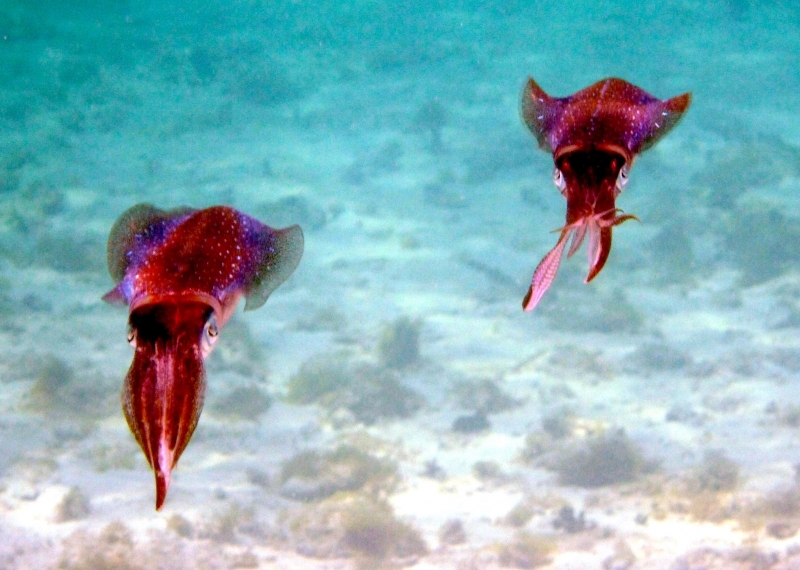 Messages such as readiness to mate, sexual identification and alarm are flashed through various colorful spots, blotches and background color. 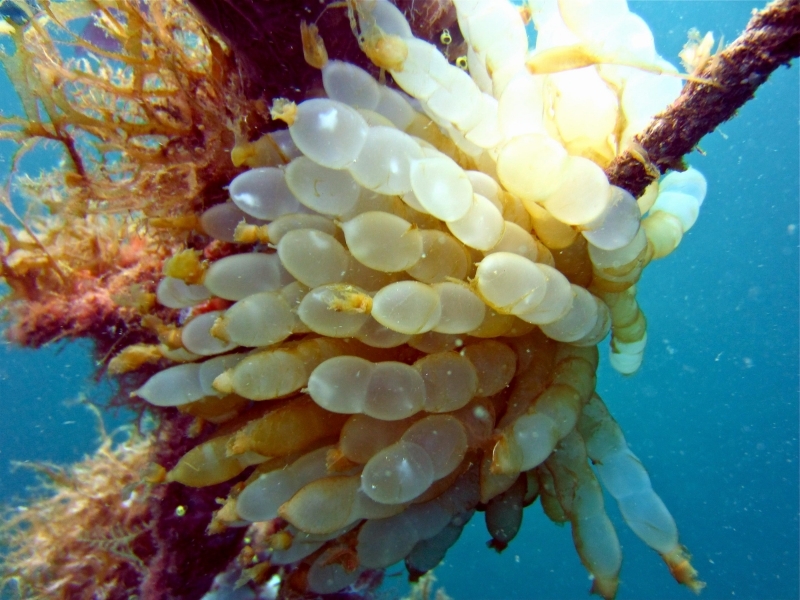 To signal slight alarm, their brow ridges turn bright gold and their central arms turn white. 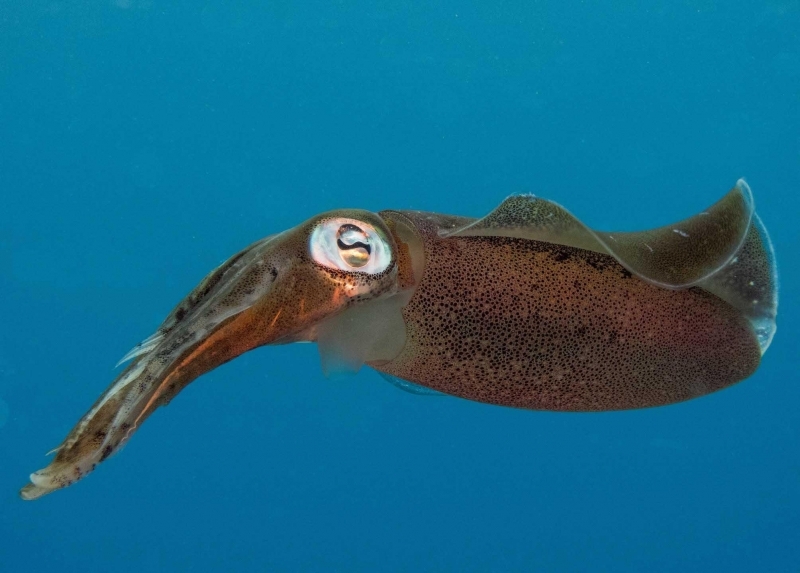 Their entire body will pale when a Caribbean Reef Squid retreats from a potential predator and in open water when faced with an extremely aggressive predator, Caribbean Reef Squids can also hide themselves and confuse predators by ejecting a cloud of black ink. 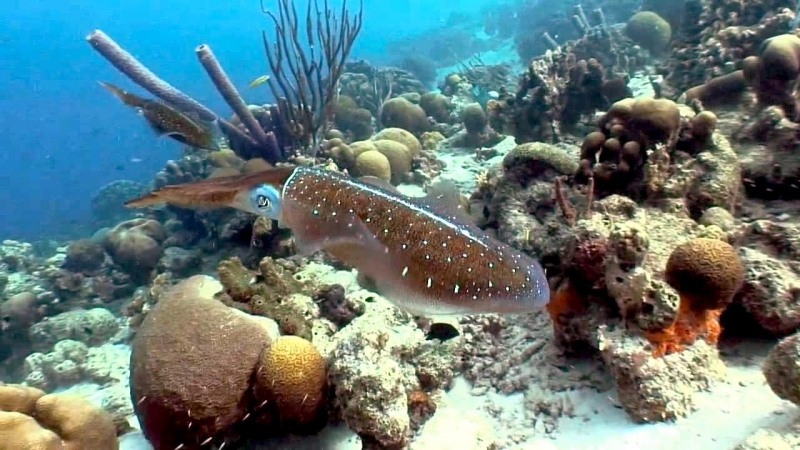 Caribbean Reef Squids are often encountered in small schools (4-30) and are usually unafraid of divers, if not curious about them. 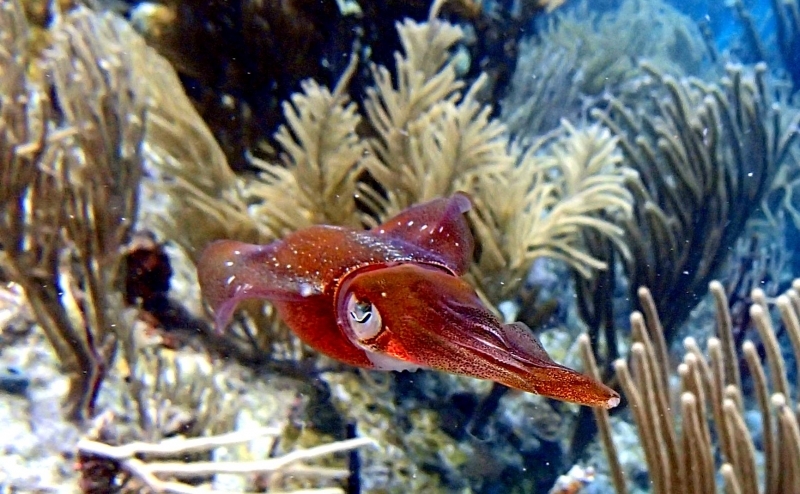 Retreating Caribbean Reef Squid near the protection of the reef will often turn dark brown or reddish in color to match their surroundings. 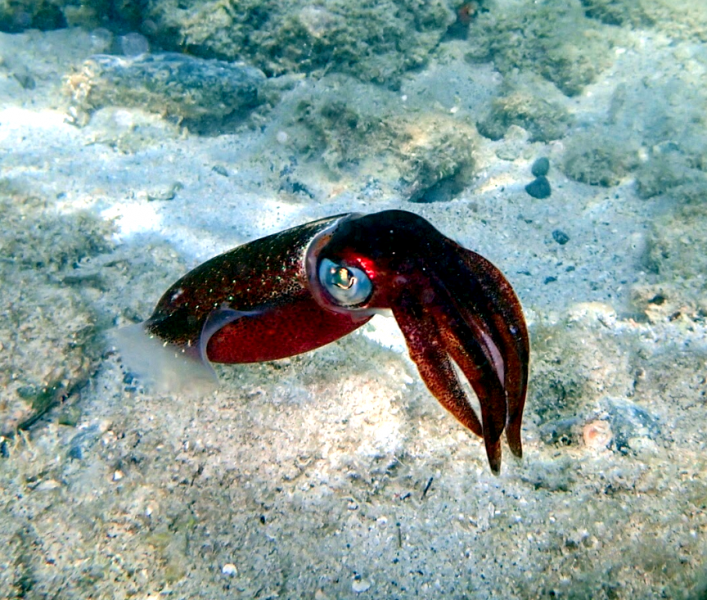 In addition to their colorful signaling behavior, Caribbean Reef Squid display unique behaviors such as pointing their bodies upward or vertically prior to striking a fish or prey, curling upward during territorial disputes and in hostile situations and pointing head-down when approached by a predator in open water. 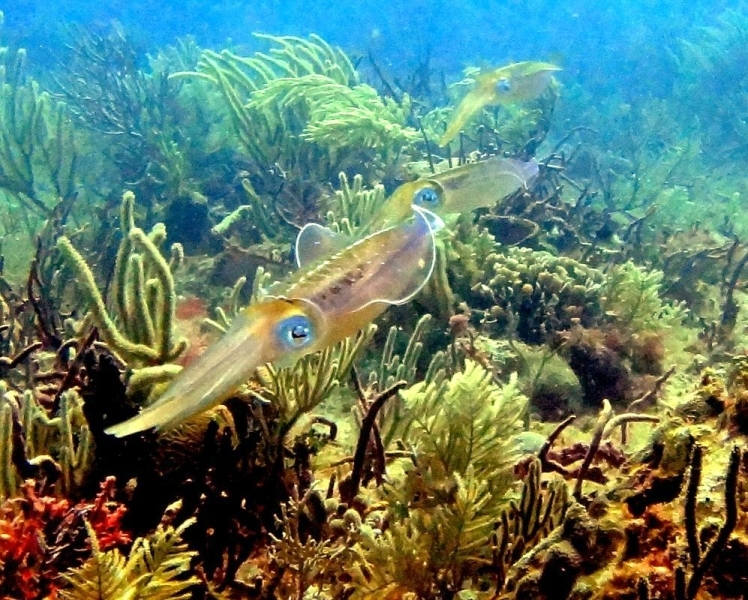 The habitat of Caribbean Reef Squid changes according to the squid’s stage of life and size. 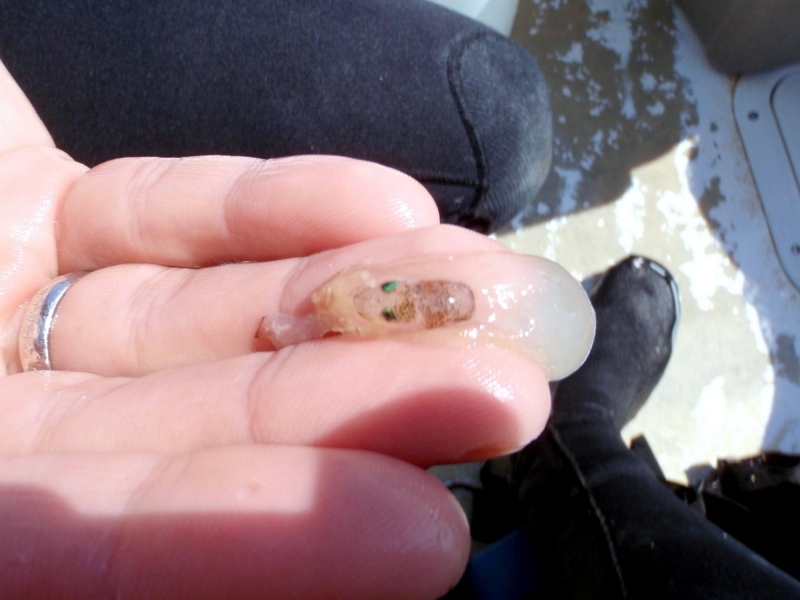 New hatchlings tend to reside close to the shore in areas from 0.2-1 meter below the surface on or under vegetation. 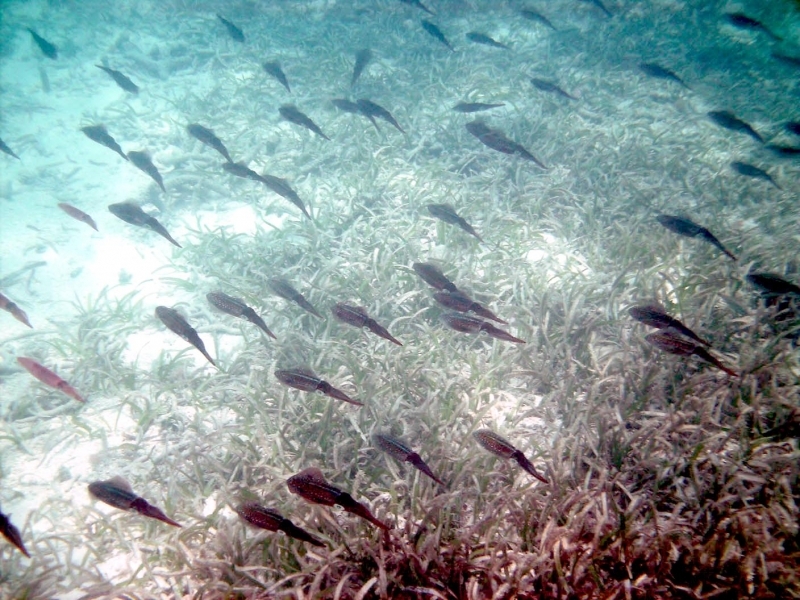 Young Caribbean Reef Squid typically congregate in shallow turtle grass near islands and remain 0.4 centimeters to 2 meters from the surface to avoid bird predators. 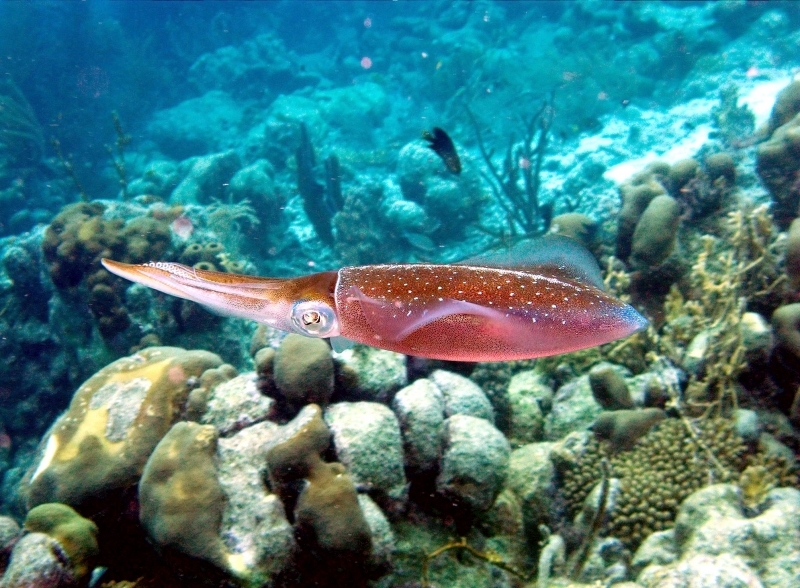 Adult Caribbean Reef Squid venture out into open water and can be found in depths up to 100 meters. 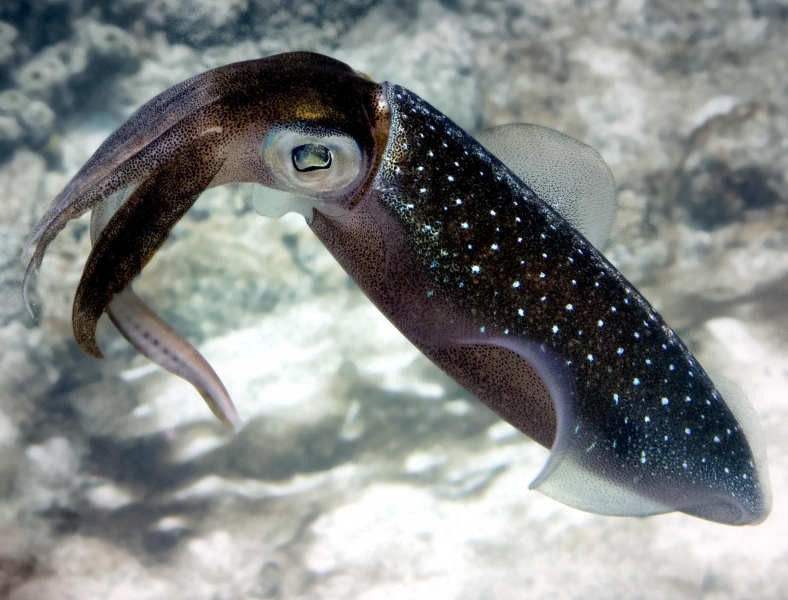 When mating, adults are found near coral reefs in depths of 1.5-8 meters. 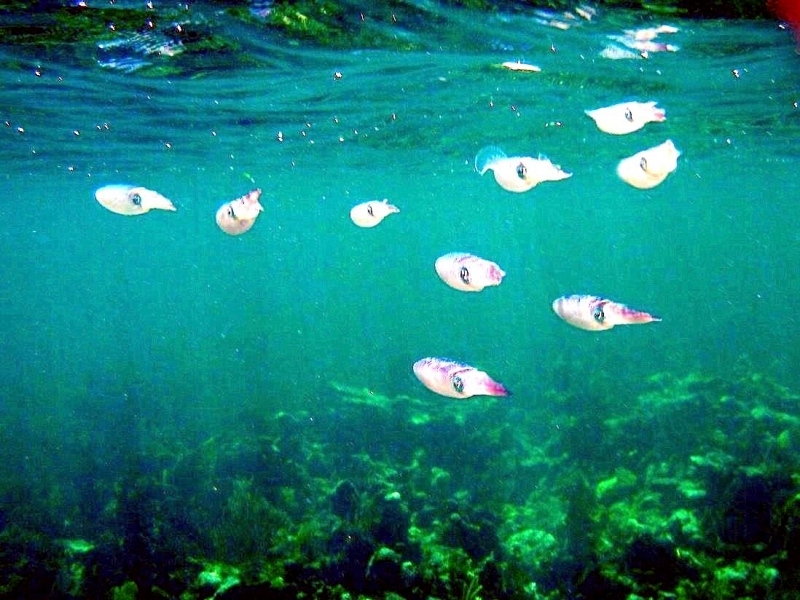 They communicate through a variety of complex signals controlling the pigment in their skin. Messages such as readiness to mate, sexual identification and alarm are flashed through various colorful spots, blotches and background color. 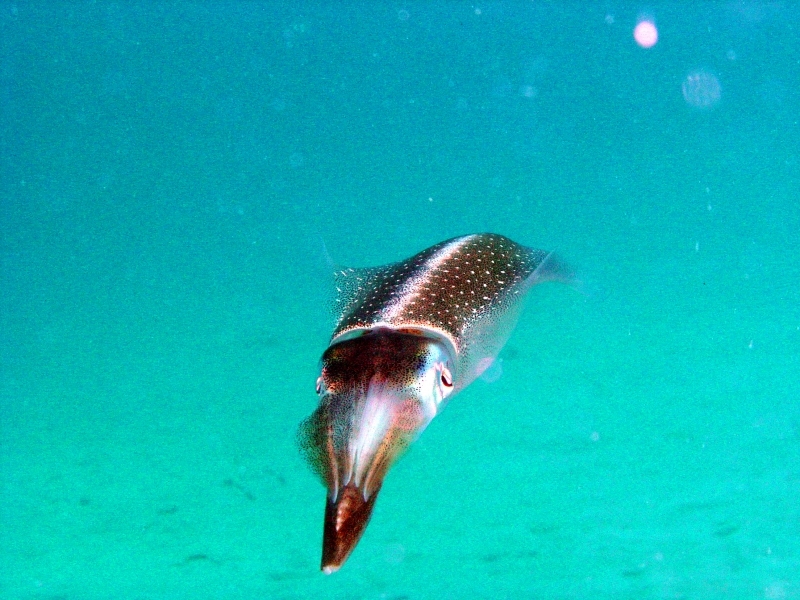 To signal slight alarm, their brow ridges turn bright gold and the central arms turn white, the entire body will pale if the Caribbean Reef Squid retreats from its potential predator and in open water when faced with an extremely aggressive predator, Caribbean Reef Squid will obstruct themselves and confuse the predator by ejecting a cloud of black ink. 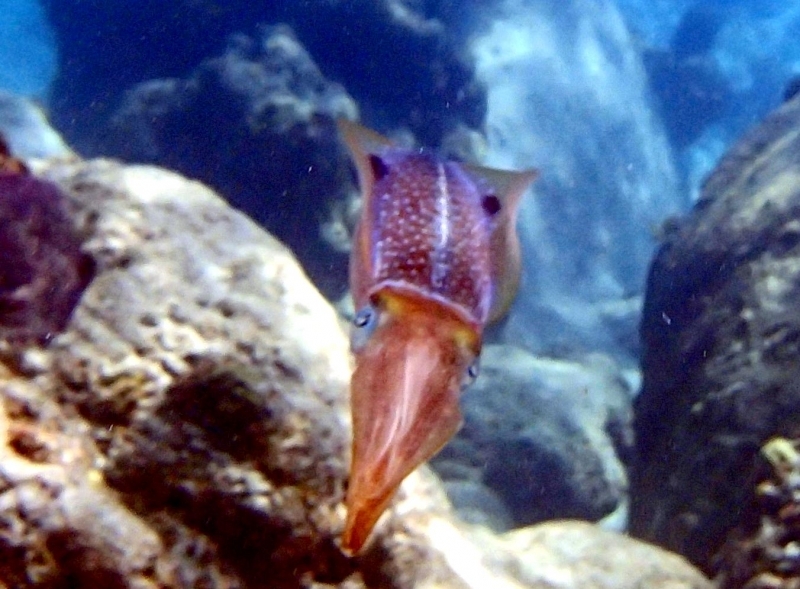 Caribbean Reef Squid can also move using jet propulsion by pressing water from the pallial cavity in the mantle through their funnel to move through the water. 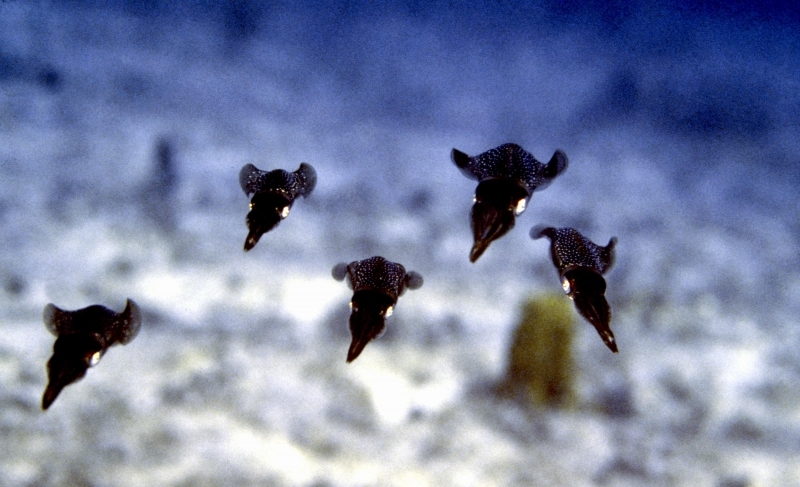 Caribbean Reef Squid can also fly out of the water using jet propulsion. 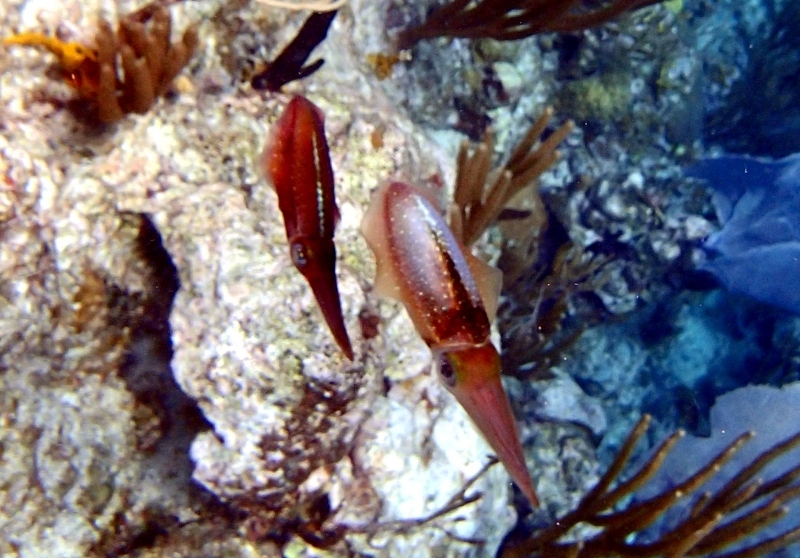 Caribbean Reef Squid is a voracious eater and can consume 30-60% of its body weight daily. 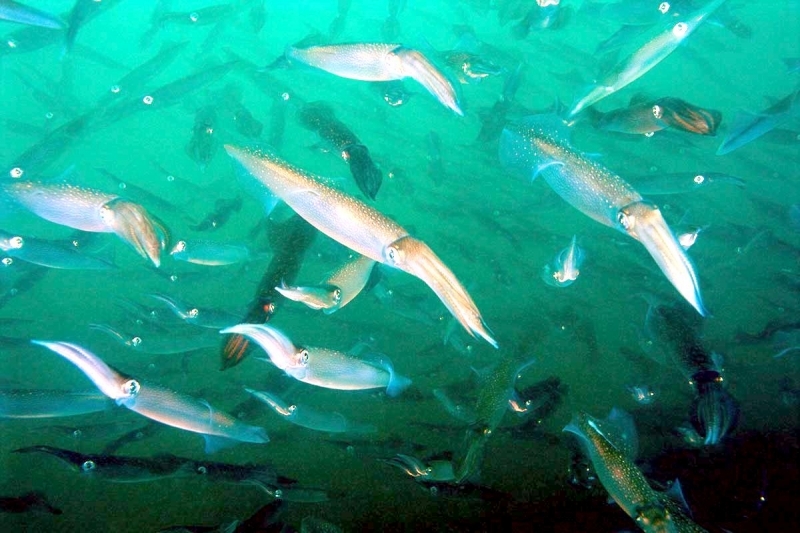 They consume small fish, other mollusks and crustaceans. 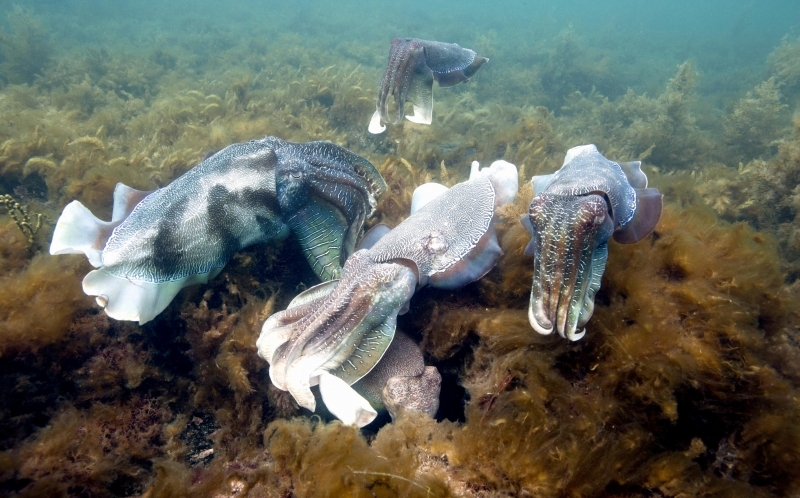 They use very tricky hunting tactics to catch their prey. 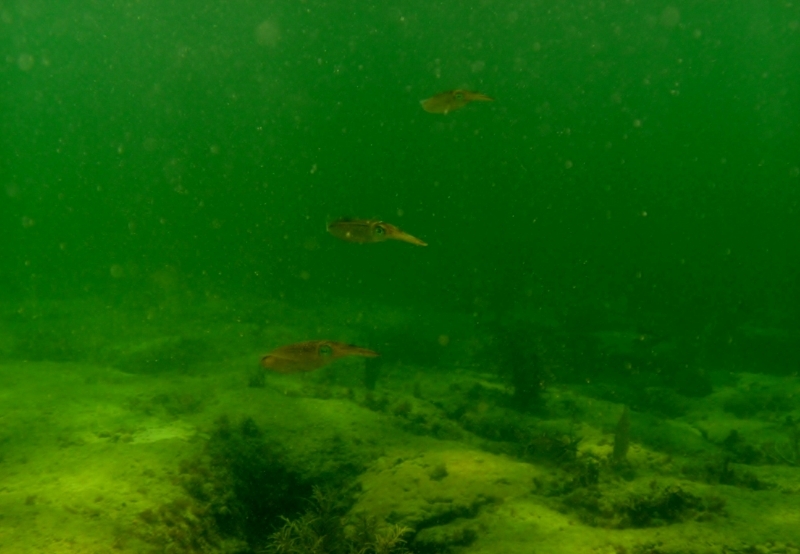 When hunting, they often mimic weeds in the water to blend in. 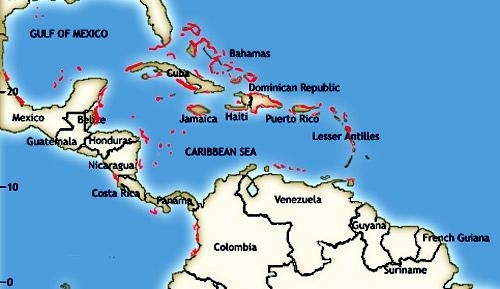 Most of their hunting is done at night. 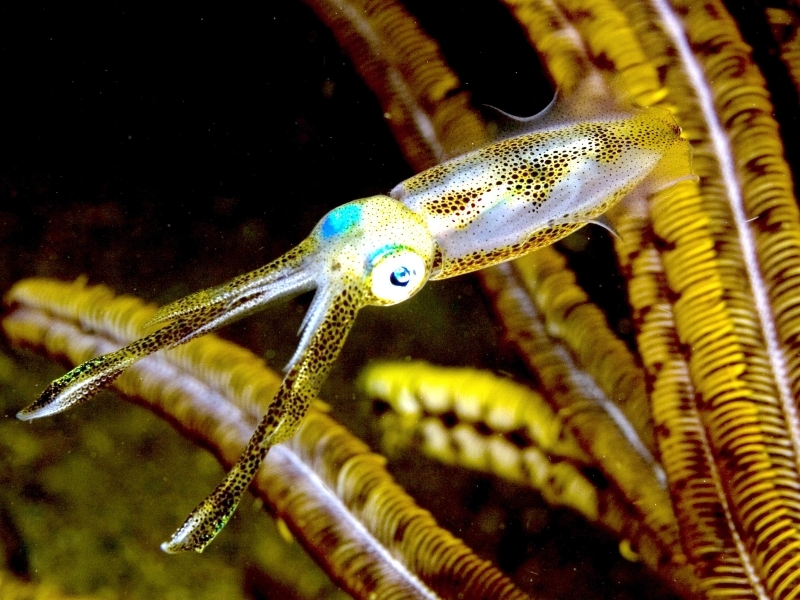 Caribbean Reef Squid are semelparous which means they die after reproducing. 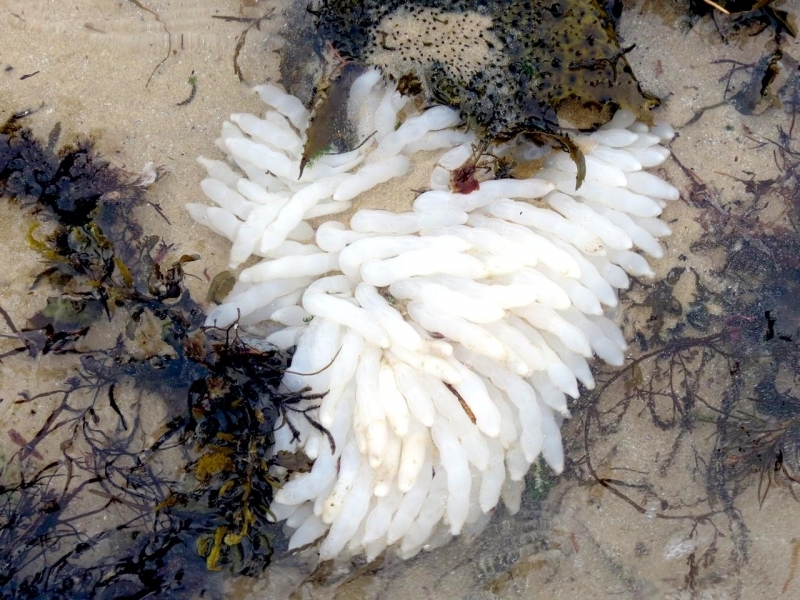 Females lay their eggs, then die immediately after. 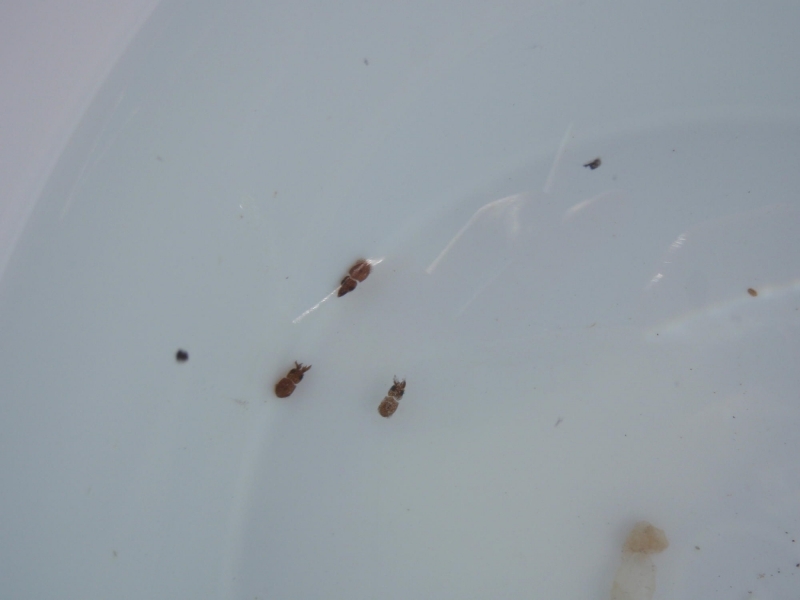 The males however, can fertilize many females in a short period of time before they die. 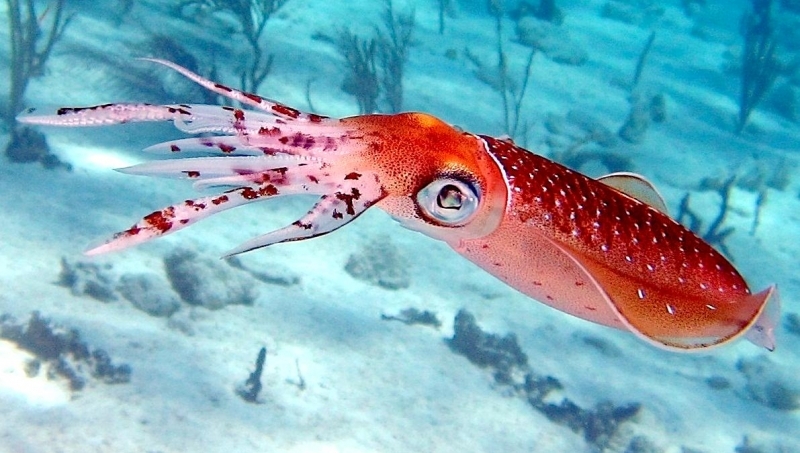 The Caribbean Reef Squid can hear a range of sound from 400 mhz to 1500 mhz. 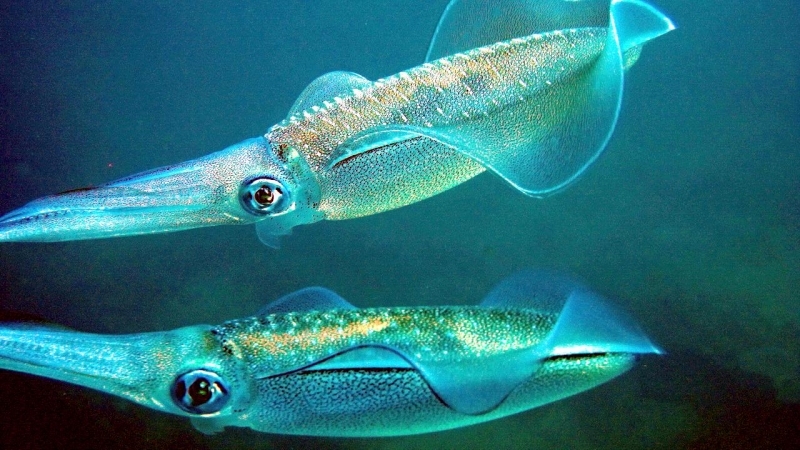 They have 3 hearts and blue blood due to the fact that it binds oxygen using a blue, copper-containing protein called hemocyanin. Human blood is red because the oxygen-binding protein hemoglobin contains iron.